We do everything we can to ensure that our impact on society is positive and effective and benefits the wider community as well as the businesses we work with. We value our local African employees and their local knowledge as our greatest asset and we put their interests and those of local communities first. Balton Rwanda has since its inception in 2007, established itself as a pioneering, powerful force within Rwanda’s ever growing economy, bringing the experience and professionalism of the Balton CP Group to Rwanda. Balton Rwanda, is the youngest subsidiary of the Balton CP group, a British multinational company with a strong presence across Africa, which made its initial steps in Africa in the early 1990's by acquiring controlling interest in the Israeli multinational, Koor Trade's holdings throughout the continent. Owned by British multinational CP Holdings, a privately owned company, Balton CP acquired all remaining shares from Koor Trade in 2013, becoming the sole owner of a group of companies with roots in Africa reaching as far back as independence. 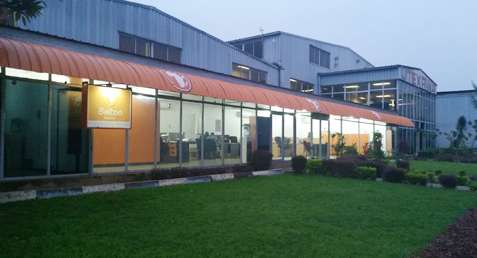 Guided and supported by a Head Office team situated in the UK, and assisted by a supplier's liaison office in Israel, Balton CP's diverse operations in Africa are spearheaded through its subsidiary companies located in Rwanda, Kenya, Tanzania, Uganda, Zambia, Ghana and Nigeria. Motivated by a passion for empowering the people of Africa and coupled with a pioneering spirit for introducing new, cutting edge technologies and knowledge. Motivated by a passion for empowering the people of Uganda and coupled with a pioneer spirit for introducing new cutting-edge technologies and knowledge, Balton Uganda continues to strive to achieve commercially sustainable development in all of its fields of expertise. The company's focus lies in four main strategic areas: Agriculture, Communication Technology, Electrical Engineering and Public Health, supported by extensive experience in Project Management throughout Africa. Thanks to its diverse portfolio, Balton Uganda has emerged as a positive influence in Uganda and continues to empower the people with modern technologies and knowledge in all of its fields of expertise. Balton CP is proud to have worked across Africa for over 50 years. Throughout that time, our mission has been to bring the highest quality products and state-of-the-art technology from world-class suppliers and to develop new services in the growing, but challenging, markets of Africa. This statement is made by CP Holdings Limited ("CP") in accordance with Section 54 of the Modern Slavery Act 2015 in relation to the financial year ending 31 December 2017. It applies to all legal entities that form part of the CP Holdings Limited Group. As part of our efforts to ensure that slavery and human trafficking are not taking place within our business or in our supply chains we are in the process of updating employee codes of conduct throughout the Group, to include clear guidelines explaining the risks of these activities and the zero tolerance approach that is taken to them. "We do everything we can to ensure that our impact on the environment is positive and effective and benefits the wider community as well as the business environment in which we operate". -To ensure compliance with all applicable environmental health and safety (EHS) laws, regulations and requirements across our business activities in all countries in which we operate. -To allocate the necessary resources to fulfill our strategies, training and program that brings added value, awareness, responsibility and accountability to the entire organization. -To provide a safe and healthy work environment through ensuring personnel are trained, informed and motivated to act safely and in respect to the environment. -To manage EHS risk effectively, actively seeking and acting upon material opportunities to reduce risk and improve EHS standards. -To participate and consult with all stakeholders, both internal and external, regarding all EHS matters. -To select suppliers, business partners and contractors with consideration of their ability to run safe and environmentally responsible operations. -To constantly monitor and review our EHS Policy and its implementation to ensure continuous improvement in our performance. These requirements are met through the implementation of Major Incident and/or Business Continuity plans, which will enable BCP to respond effectively in an emergency situation. BCP will swiftly and effectively respond to emergency situations with the foremost goals of preserving life, protecting the organization's property and restoring day to day operations as quickly as possible. -Carry out regular risk assessments in order to identify and subsequently manage obstacles to effective emergency management. -Ensure all staff are fully aware of the personal responsibility to behave in such a way as to minimize the risk of emergencies occurring. -React effectively to a major incident within/directly affecting the business so that it can, as is reasonably practicable, continue to provide essential services in the event of an emergency. -Minimize disruption when unplanned events have the potential to significantly interrupt normal business. -React effectively to a situation where there is a significant loss of staff, e.g. due to industrial action. -Ensure that all departments are involved in the preparation of the plans, so that there is an effective and consistent response to emergencies and/or service disruptions. -Respond to flooding or other unexpected weather conditions. -Ensure that all plans are reviewed and improved on a regular basis. -Support effective communications during an emergency or interruption. This policy outlines Balton CP's (BCP) commitment to achieve the highest attainable level of occupational health and safety for our staff, contractors and visitors throughout all areas of business activity. -To provide appropriate and targeted health and safety training, information and supervision for our employees, contractors and visitors across our business activities and sites. -To ensure that all health and safety hazards and incidents are promptly reported and investigated and that appropriate control measures are implemented to eliminate or minimise the risk of recurrence. -To review and revise the company's occupational health and safety management systems and monitor the effective implementation of this policy at regular intervals.